The mid-nineteenth and early twentieth century saw the introduction of art based on daily life, a depiction of everything from the street vendors to the homeless in and around France. Artists were often deeply embroiled in the social issues of the time and sought to free themselves from the imposing historicism that had stifled art production for decades. The movement known as “Realism” found supporters in the progressive art critic Jules Castagnary and artists such as Victor Gilbert promoted a realistic display of modern life in its many permutations. Gilbert became one of the artists who carried Realism further into the twentieth century and who also fell under the influence of the Impressionist movement by searching for new methods of representation, often less gritty than his earliest work. Victor-Gabriel Gilbert was born February 13, 1847 in Paris, just shortly before the 1848 Revolution which brought about reforms in the Salon system that allowed more artists to introduce new work. Since Gilbert’s parents did not have enough money to send him to the École des Beaux-Arts for training, the typical route for aspiring artists, he instead began working as an apprentice at thirteen to Eugène Adam, a painter decorator. At night he would also take lessons at the École de la Ville de Paris, which was his only form of official artistic training. As many of the École des Beaux-Arts ateliers relied on a more rigidly academic form of training and style of painting, his lack of extensive studies may have forced him to look towards daily life for his inspiration. Gilbert debuted at the Salon of 1873 with Les Apprêts du Diner (Preparing Dinner) and Avant le Bal (Before the Ball), just a year before the Impressionist group showed their paintings at the first “Impressionist” exhibition at the photographer Nadar’s studio. During the mid 1870s Gilbert was supported financially by Père Martin who owned an art shop on the rue Lafitte and who was an important supporter of the Impressionist movement and the promotion of young and promising artists. He secured several of Gilbert’s works for himself and in return, Gilbert executed Portrait of Mme. M…(Portrait of Madame M…), which was exhibited at the 1875 Salon. From then on Gilbert was well-established enough as a painter that he no longer had to complete decorative work for textile manufacturers (The Realist Tradition: French Painting and Drawing 1830-1900, ex. cat., Cleveland: The Cleveland Museum of Art, 1980, pg. 294). Many artists came to rely more and more on art dealers for sale of their images. Martin’s sponsorship of Gilbert’s work helped in the dissemination of his realist images; making him more popular with a larger audience that continued to respond to these easily recognizable and understandable images. This also placed Gilbert among some of the most progressive artists of the period. Victor Gilbert’s ability to capture different work activities and social types is another aspect of his style. Gilbert’s frequent visits to Les Halles enabled him to witness many activities. 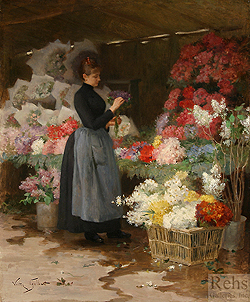 Stressing the actuality of the scene, his visual description helped make him the renowned master of Les Halles by 1885. 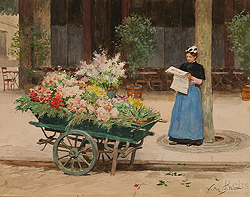 Gilbert had created a niche for himself and for his work in the realistic depiction of the aspects of Parisian life; he had also become popular with the State as not only was his 1880 painting purchased by them, but his 1884 (Porteurs de Viande - Meat Haulers) Salon entry was as well. 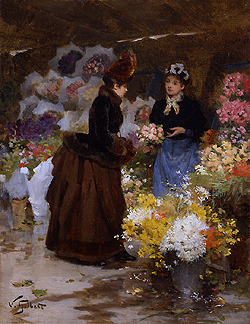 As his style progressed, Gilbert did not neglect solely bourgeois scenes, such as Marché aux Fleurs (Flower Market), linking him more intimately with Impressionist painters, especially Pierre-Auguste Renoir and his interest in beautiful bourgeois women taking part in their leisurely activities, paintings that were a far cry from the work of many of the earlier Realists. With this shift in theme, Gilbert also moved towards a lighter toned palette, instead of the dark palette reminiscent of earlier Realists such as Théodule Ribot and François Bonvin. Gilbert continued to submit regularly to the Salon until 1933. In 1926 he received the Prix Bonnat. Earlier in his career, in 1897, he was also named Chevalier de la Légion d’Honneur and was also a Salon juror at one point. Gilbert died on July 21st, 1935, and is now buried at the Montmartre cemetery in Paris. Victor Gilbert was not only influenced by Realism, but also by Impressionism. His life and Salon career lived through a period of consistent stylistic transitions, influenced by the times. 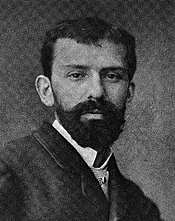 His early career was preoccupied by Realist themes, scenes of daily life, but as the Impressionist had made there mark and La Belle Époque had come and gone, he moved more towards genre scenes including elegant bourgeois women and family, and especially young children, devoid of the gritty and less “picturesque” vision of daily life. As more of Gilbert’s works become known, perhaps further influences will come to light and the oeuvre of this artist will become even more diverse.